One of our favorite restaurants in Dallas was Tei Tei’s Robata, a Japanese sushi and Robata grill restaurant. Since moving to Austin, we have not found a comparable restaurant. 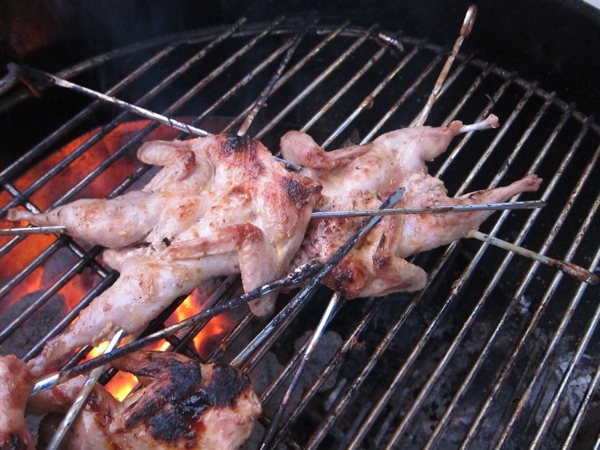 Robata, translated as “around the fire place”, is a style of grilling where food is cooked on a charcoal hearth available in the traditional Japanese home. Today, the hearth is replaced by small hibachi grills. In the US, “hibachi style” is often confused with what is actually teppanyaki cooking, where 1 chef cooks on a large hot plate with lots of theatrical flair. For Sunday dinner, I wanted to make Udon noodle soup, and I thought that some grilled baby octopus and shrimp would be a good addition to the meal. After purchasing my Webber charcoal grill, I also bought charcoal tray inserts so I can easily create heating zones. I thought that using 1 tray would be a good substitute for a smaller hibachi. 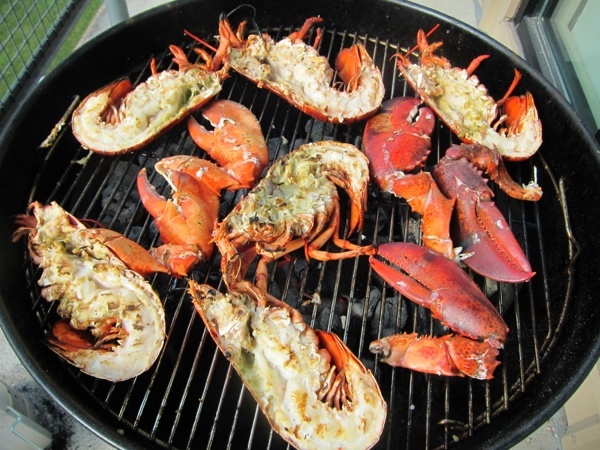 In effect, only 1/3 of the grill surface will be utilized. 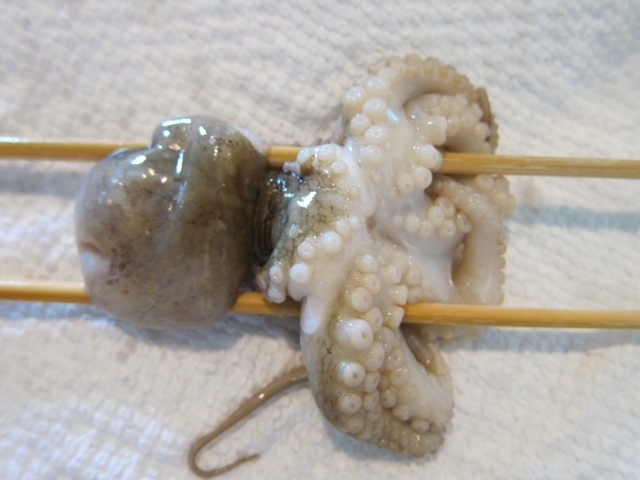 To prepare the baby octopus, you need cleaned, whole, patted dry baby octopuses, which should be available at Asian supermarkets, and water soaked bamboo skewers. When cleaning the octopus, make sure you check for the beak like mouth of the octopus, which is located in the center of the octopus where all the tentacles meet. The beak is a little brown, fish scale like thing that comes apart in two pieces, so be sure to get both pieces. It’s probably edible, but who likes eating fish scales? 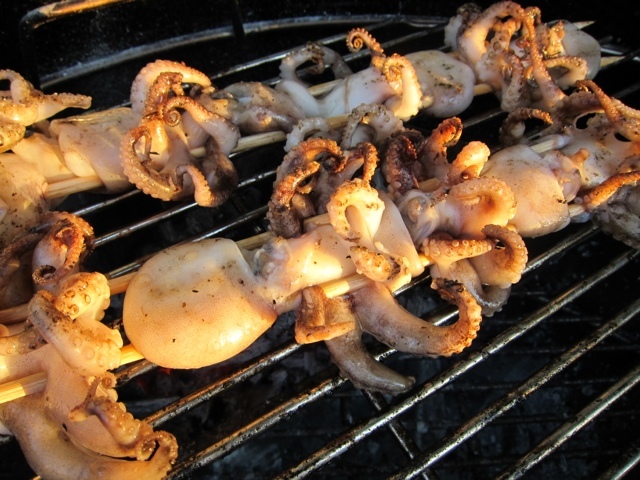 The octopus is carefully threaded on the skewers, so that the tentacles won’t fall through the grill grates. 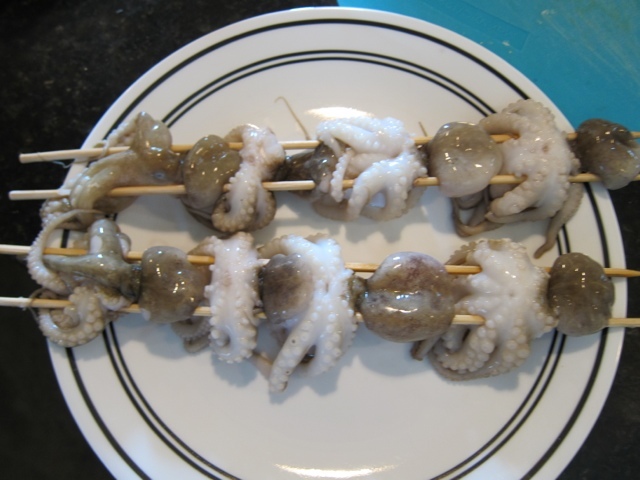 I think I will invest in some metal grilling skewers after this experience because it took some effort to get the octopus on the bamboo skewers. 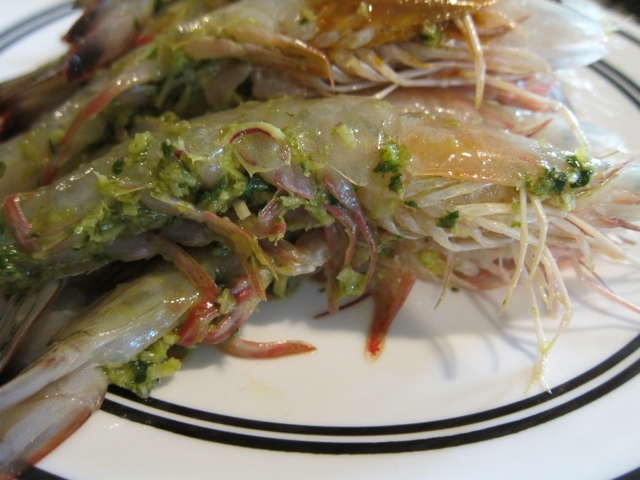 To prep the shrimp, I made a yukukosho pesto. Yuzukosho literally means ” yuzu pepper” in Japanese. 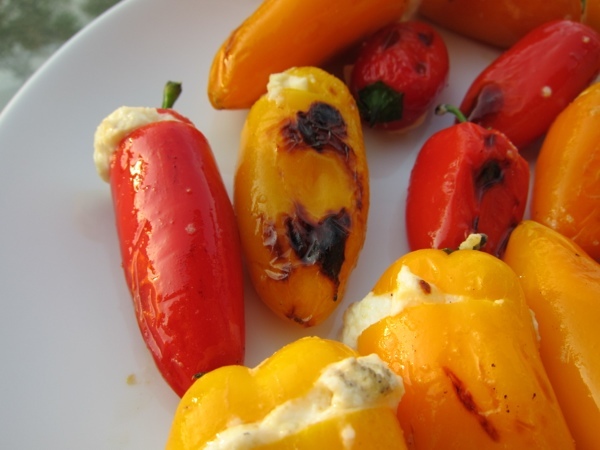 It’s made from pounding together yuzu zest, salt, and hot chile peppers. 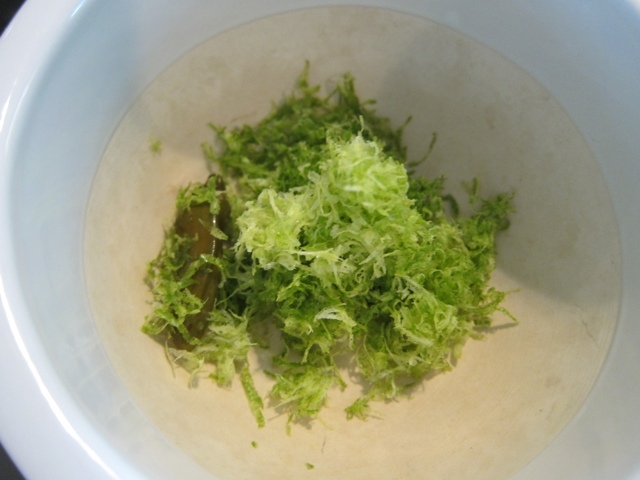 Since I didn’t have access to yuzu citrus, I substituted limes and lime zest. 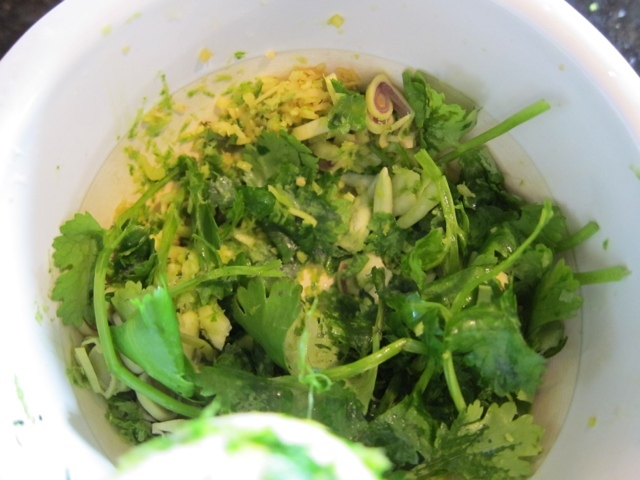 To make the Yuzukosho pesto, I added lemongrass, cilantro, garlic, and ginger to the Yuzukosho and pounded them together in a mortar. 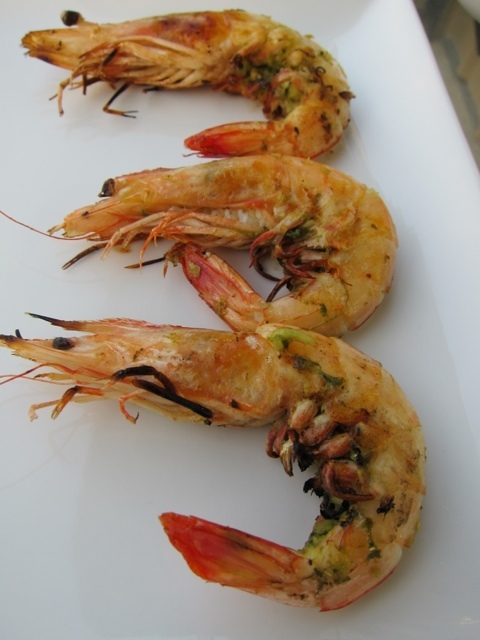 I used head on shrimp because the head and shell are great at retaining moisture and adding flavor. To marinate the shrimp, I butterflied the shrimp from the leg side, leaving the shell and head on, then rubbed the Yuzukosho pesto on the inside and outside of the shell. 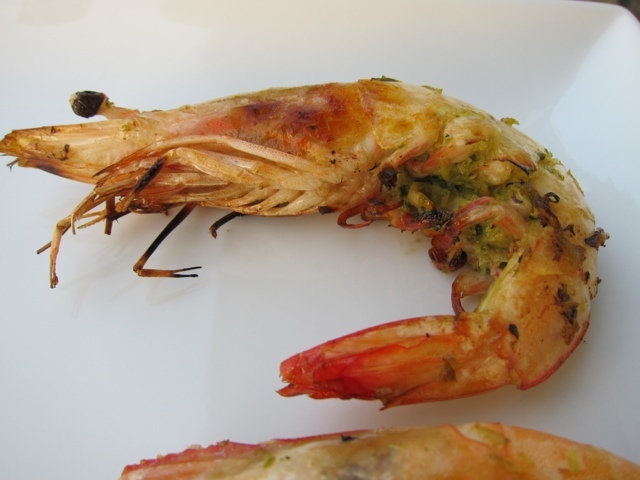 The shrimp should be marinated for 10 minutes before grilling. I prepped the fire using a chimney starter, and used real wood charcoals. After about 20 minutes of burning, the coals where ashed over and ready to be used in the grill. 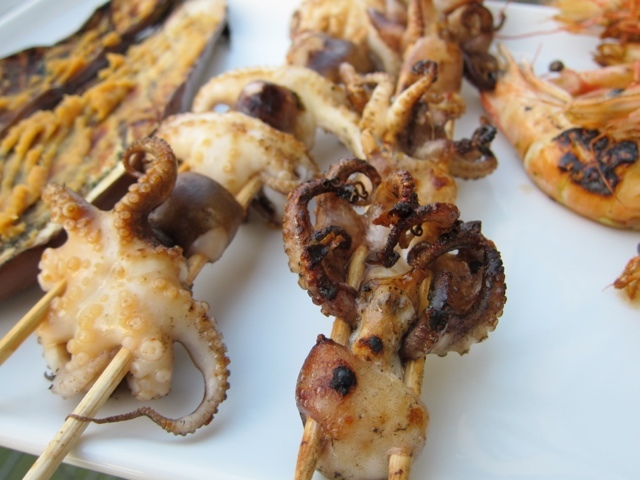 Since the shrimp and octopus will cook quickly, the heat should be high, and direct. 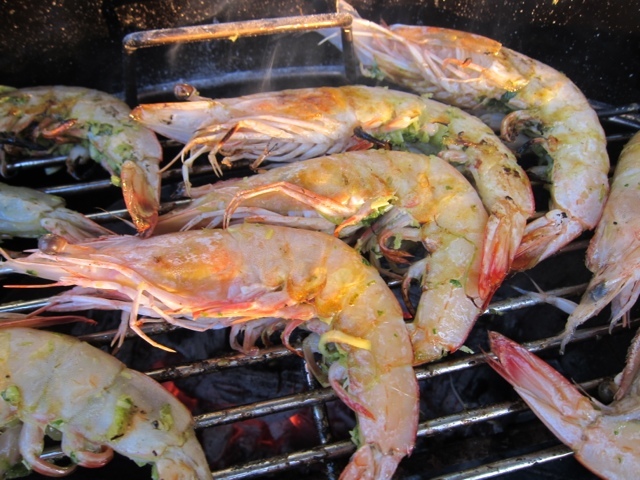 The shrimp is added to the grill, directly over the coals, with the lid on, turning after 2 minutes. The shrimp will be ready in 4 minutes total, to avoid over cooking. 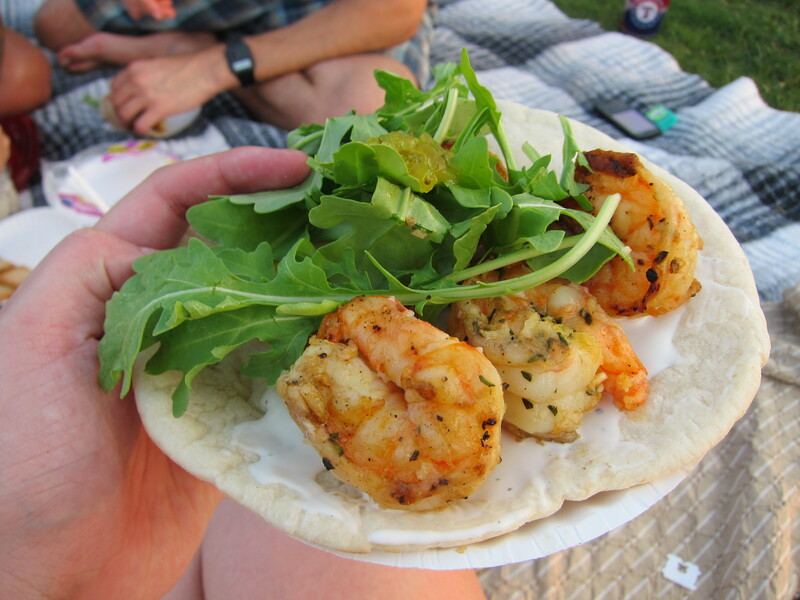 The shrimp should be slightly charred on the outside and juicy in the middle. The baby octopus also takes about 2 minutes per side, but I decided to cook it after the shrimp because of the Tare glaze I used at the end of the cooking process. Tare is a Japanese dipping sauce used on grilled dishes made out of sake, sugar, and light soy sauce. 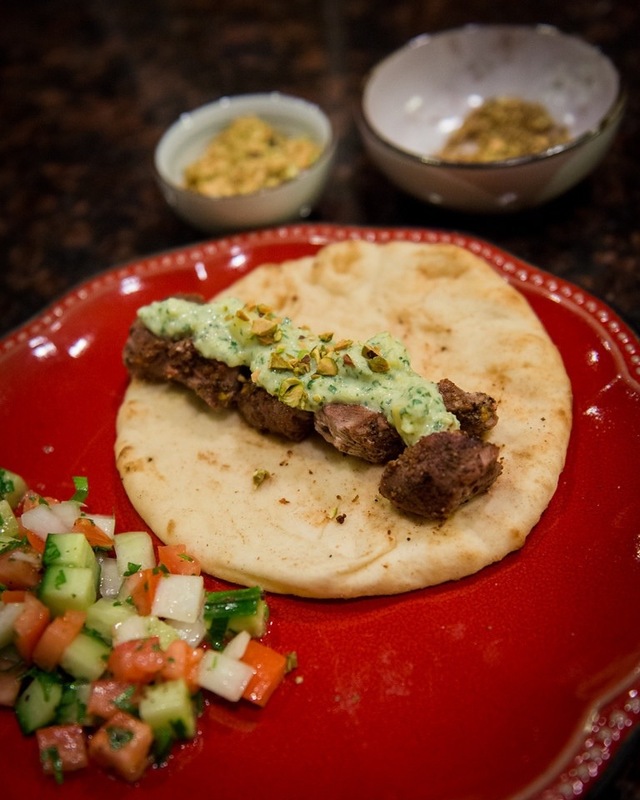 The Tare is usually used as a finishing sauce , and brushed on the grilled food when it has almost completed cooking, then grilled over high heat for the sauce to caramelize. 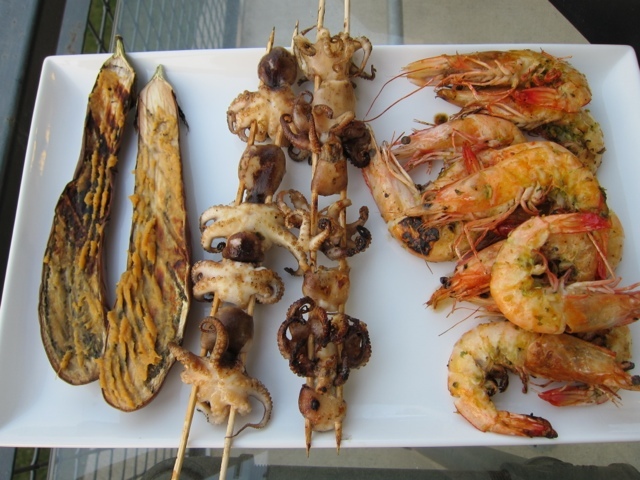 This process may sometimes leave a sugary residue on the grill grates, and since the shrimp had a different marinade, I didn’t want to mix the favors, so I grilled the octopus second. Overall it was a great learning experience. Next time I think I will use both charcoal trays to increase the heat. 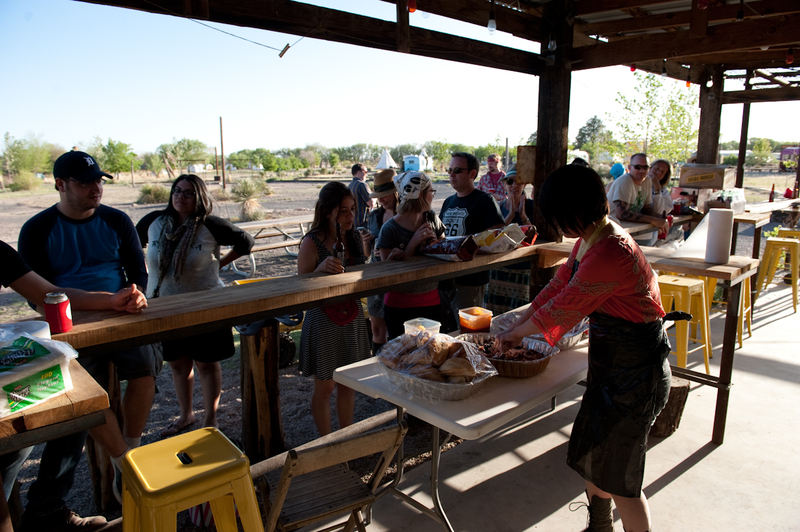 Two of my favourite people were getting married, and the weekend before the wedding, they had the idea to hold a joint bachelor/bachelorette party with all their friends in Marfa, Texas. Marfa is a small artist commune way out in west Texas; it is also where the movies There Will Be Blood, and No Country for Old Men were filmed. To get to Marfa, it’s a 9 hour drive from Dallas, where the bride and groom to be are from, and a 6 hour drive from Austin, where we were heading out from. Around 25 people signed up for this trip, some coming from Austin like us, other from Corpus Christi and Fort Collins. Being a small town, there are not many places to eat, and most people who go out there are campers, so food for 25 people was an issue we had to resolve. I volunteered to handled a cookout for everyone Friday night, and got to planning the menu a few weeks in advance. The place our party was staying at is this neat little compound called El Cosmico. At El Cosmico, there were Safari tents and Indian Teepees you can rent. There are also very nicely remodeled and roomy RV trailers that were available to rent as well. I called the El Cosmico people and found out that there was an outdoor kitchen area that had a few grills and a fridge, but I didn’t know how big, or how many of them worked. Originally, I was thinking of doing a whole pig roast, but due to the burn ban at Marfa, it was not possible to set up a fire to roast a whole pig. I also was wary of how busy the camp site was going to be and how many other people may be using the grills available in the kitchen area. 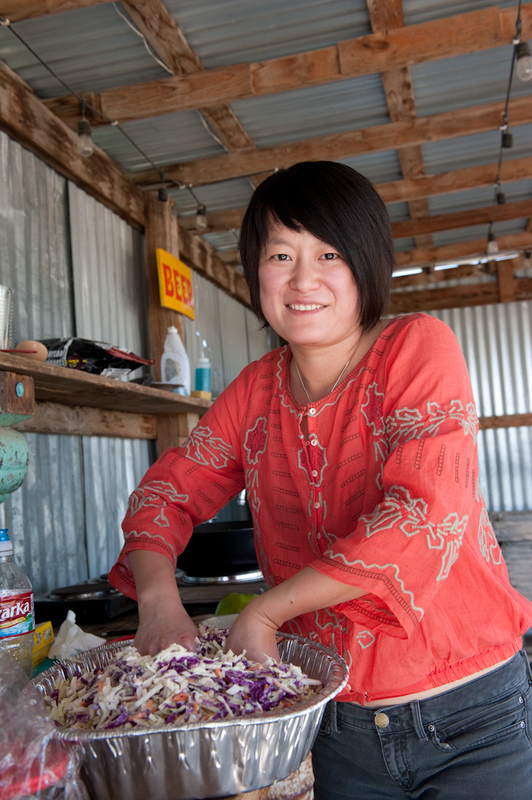 The last thing I want is to lug a bunch of food to Marfa and have no way to cook it. After some research for the recipes, I found a recipe that seemed to be adaptable enough to guarantee that people will be able to get fed. 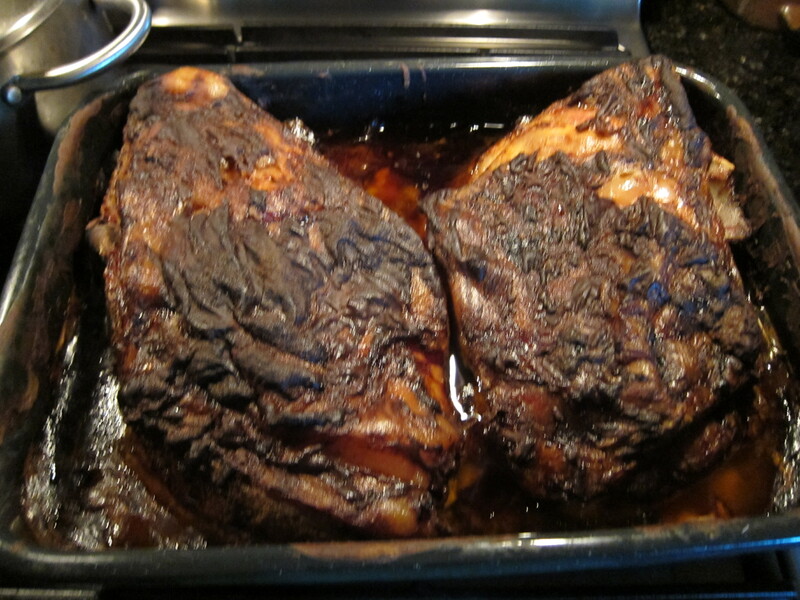 Whole bone-in pork shoulders are slow cooked in a 275F oven for 12 hours, then finished off on a smoky grill for 2 hours. 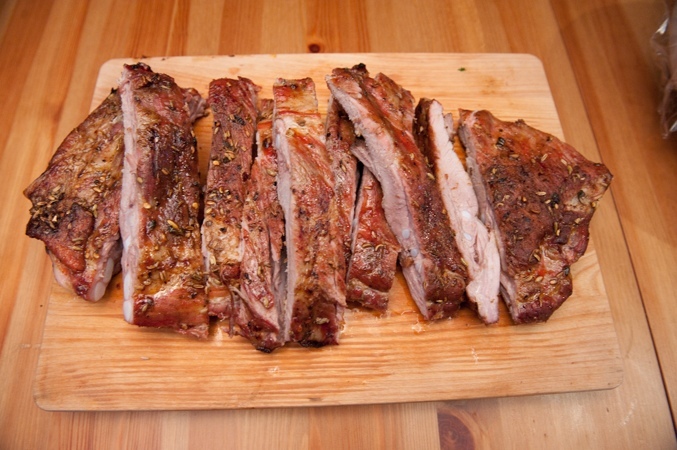 After the pork is removed from the oven, it can be cooled down and refrigerated over night until it’s ready to be smoked. 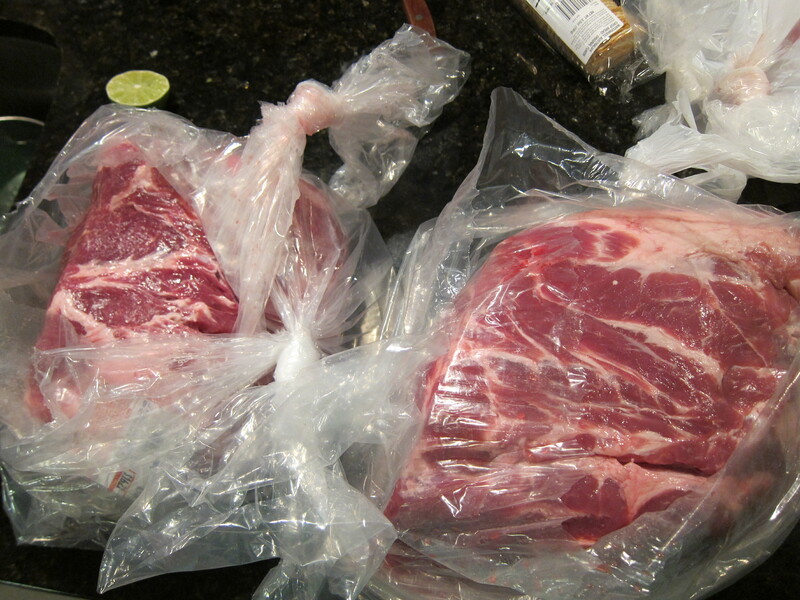 Since we were headed to Marfa Thursday, I decided to start the pork Wednesday night at 8PM, then letting it cook until 8AM Thursday morning, then cooled for a few hours until it can be handled and wrapped in plastic wrap. It will stay in a cooler until we get to the camp site, and then the pork will be moved to a fridge until Friday evening time when it’s ready to be cooked. To feed 25 people, I bought 18Lbs of bone-in pork shoulder. The recipe calls for skin-on, bone-in pork, but I was only able to find skinned bone-in pork shoulder, which worked out just as well. 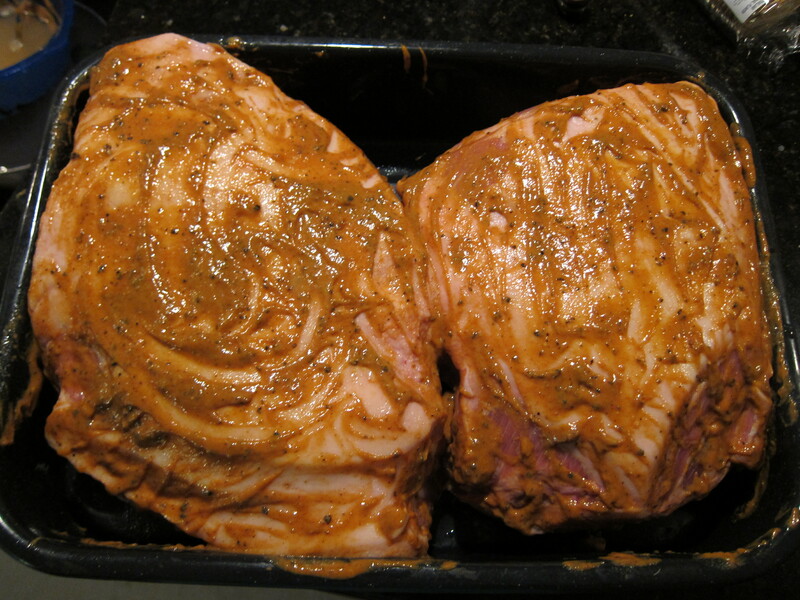 The pork is covered in a Dijon mustard, paprika, onion powder, brown sugar, and pepper marinade. 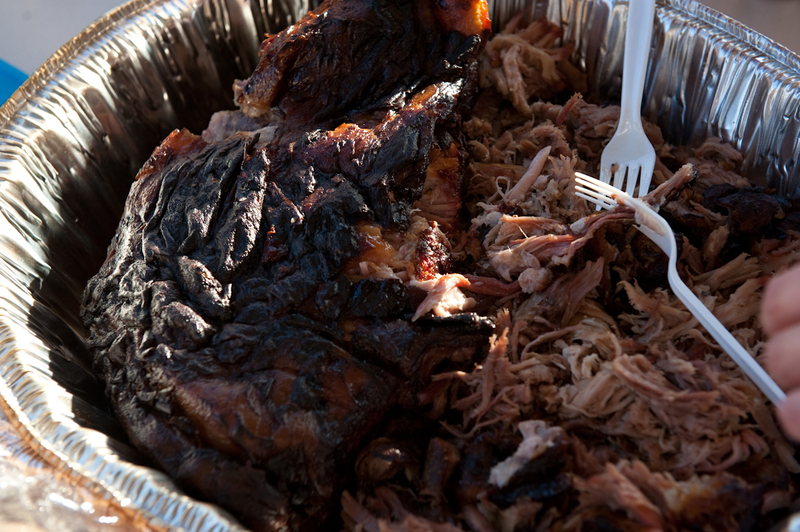 The pork is slow roasted, fat side up, in a 275 oven for 12 hour depending on the weight of the Pork shoulder. I only roasted my pork shoudlers for 10 hours since they were 10 lbs and 8 lbs respectively. For a 12-14 lb single pork shoulder, it will probably take about 12 hours. 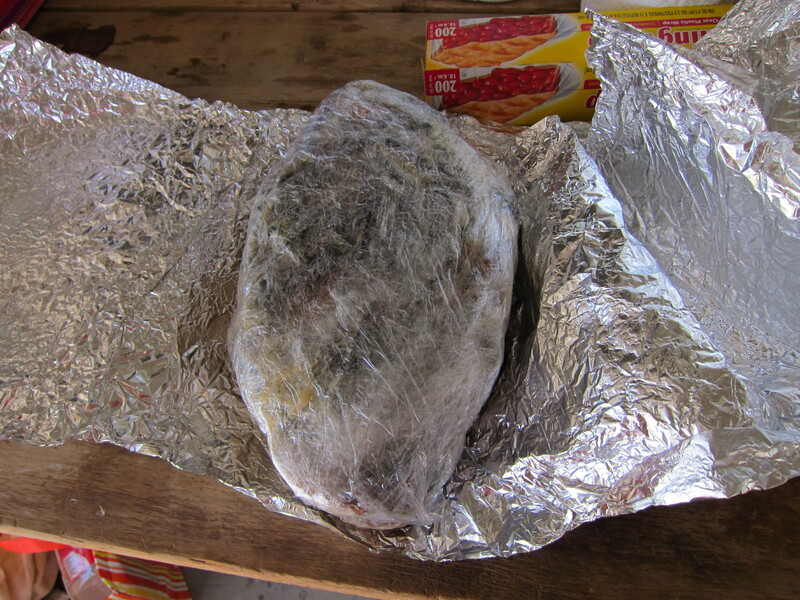 The pork is cooled for a few hours until it can be handled, and it is wrapped tightly in plastic wrap, then a layer of heavy duty aluminum foil. I placed it in a cooler filled with ice, and once we got to the camp site, the shoulders were placed in a fridge in one of my friend’s trailers. We got in around 9PM on Thursday night, so I did not get a chance to check out the kitchen in day light. First thing Friday morning, I went to check out the outdoor kitchen, and it was possibly the best I could have hoped for. There was a full size fridge, 4 medium sized grills, a large prep table, 4 burners ( 3 of them worked), and a large sink. Dinner was set at 7PM on Friday, so at 4PM I started building the fire for my grills. For the pork, I only needed enough charcoal to warm up the pork shoulders and keep the smoke going. While the fire is starting, I started to get the pork ready. 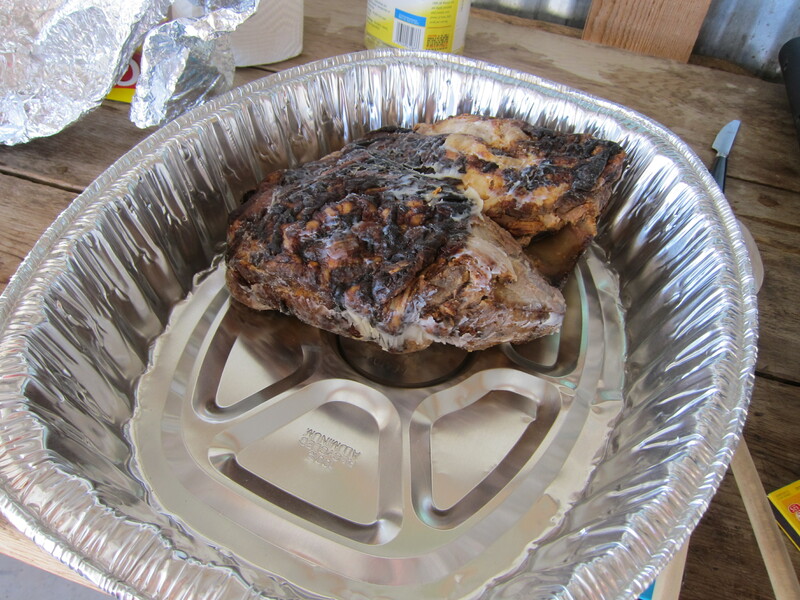 I unwrapped the pork and placed them in a large disposable tin pan. The pork is smoked for 2 hours on low heat in a pan on the grill. 2 hours was just enough time to allow the smoke to penetrate the meat, and the low heat allowed more fat to render off from the pork shoulder and keep the pork moist and juicy. 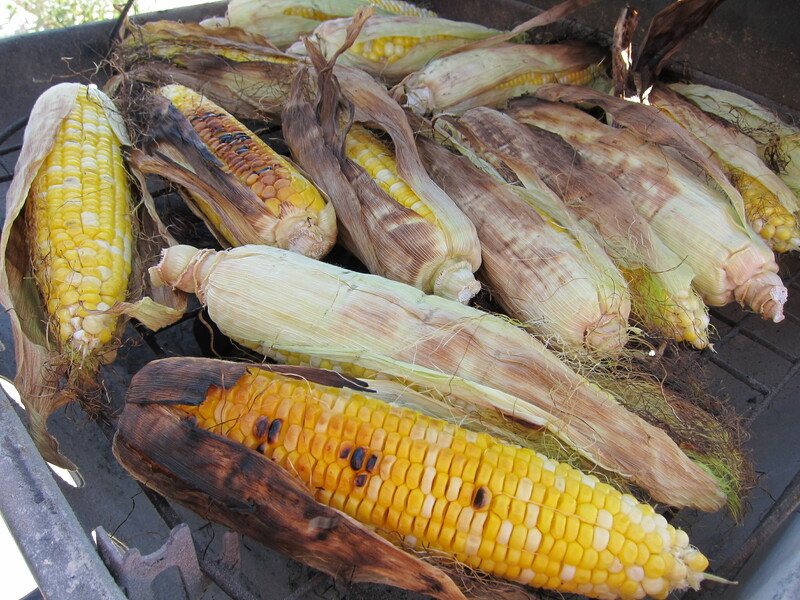 I unhusked the corn until 1 or 2 layers of husk still remained, and this is to keep the corn from burning on the grill. I built a medium fire on the grill, placed the corn on the grill, and closed the lid. 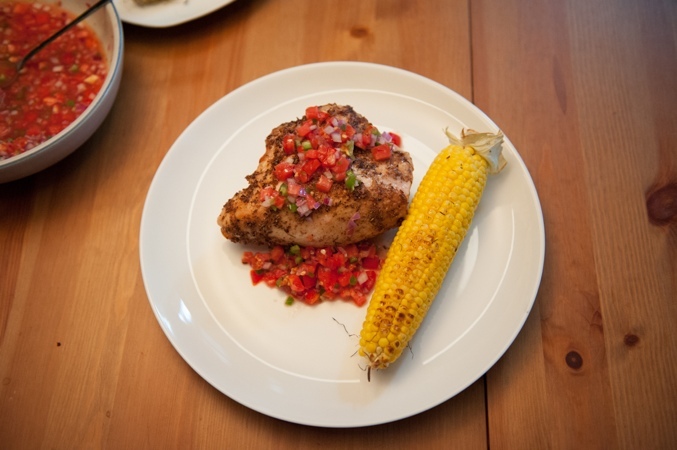 Occasionally I came to turn the corn and move ones that are less cooked around the perimeter of the grill towards the center of the grill. I also made a red and green cabbage coleslaw with apples and caraway seed dressing, but I didn’t have time to take pictures of it. I bought the cabbage a day in advance and kept it wrapped in plastic wrap. I also made the dressing a day in advance and kept it cold in either a cooler or a fridge. Once I started cooking, I sliced up all the cabbage and the apples, mixed in the dressing, covered the dish with plastic wrap, and kept it refridgerated until ready to be served. The green apples and crunchy cabbage in the slaw made a great contrast against the smoky pulled pork, and it also help cut through the fattiness of the pork. 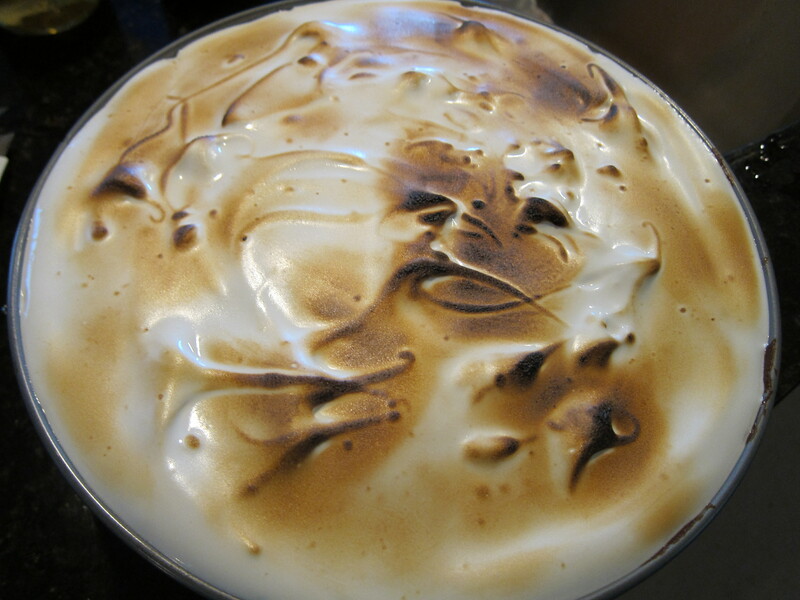 I also made one of my favourite desserts for cookouts: Smores Cheesecake. The cheesecake is composed of a graham cracker crust, chocolate cheese cake, and a marshmallow meringue topping. 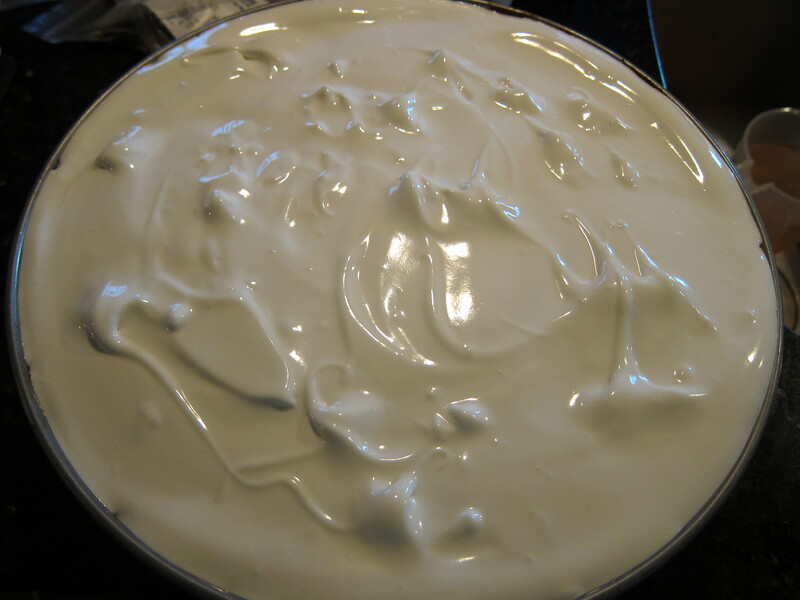 I made this cheesecake a day in advance and kept it chilled until it was ready to be served. 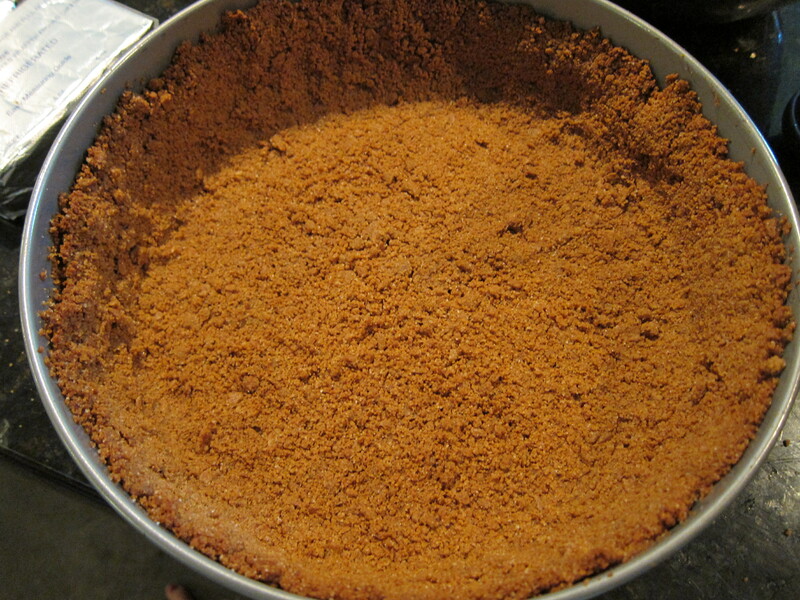 To make the crust, graham crackers, butter, and sugar are processed together, pressed on the bottom of a springform pan, and baked until firm. 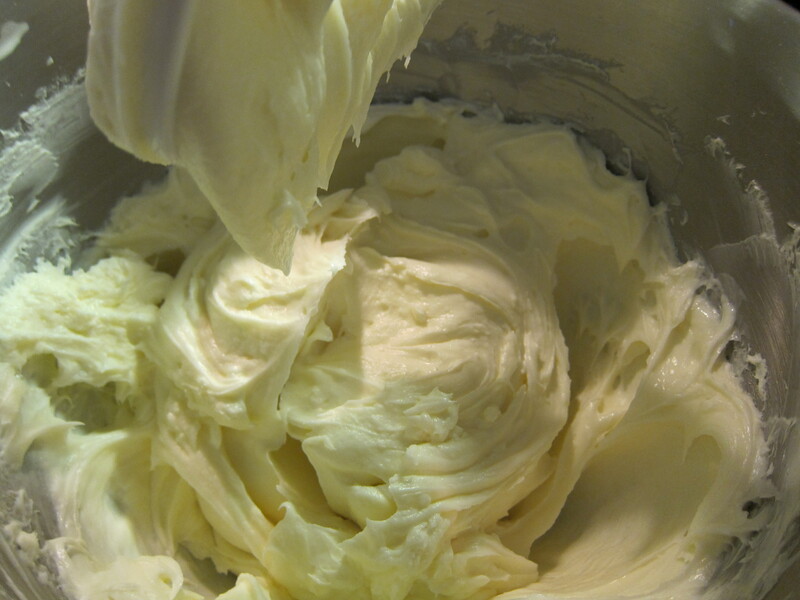 To make the filling, room temperature cream cheese, sugar, and a pinch of salt is blended in a stand mixer until smooth. 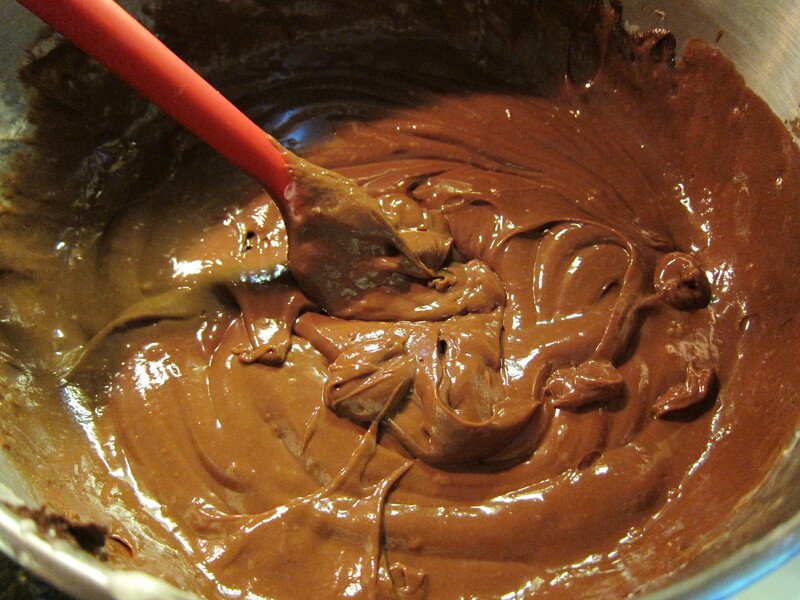 Heavy whipping cream is added to the mixer, then cooled melted chocolate, then the eggs are added to the mixer, one at a time, until well combined. 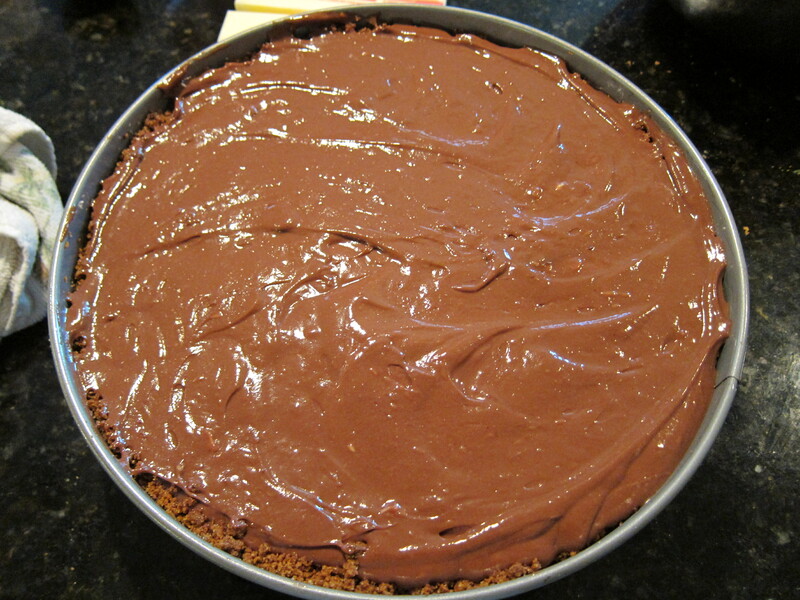 The filling is poured into the crust, and smoothed out with a offset spatula. 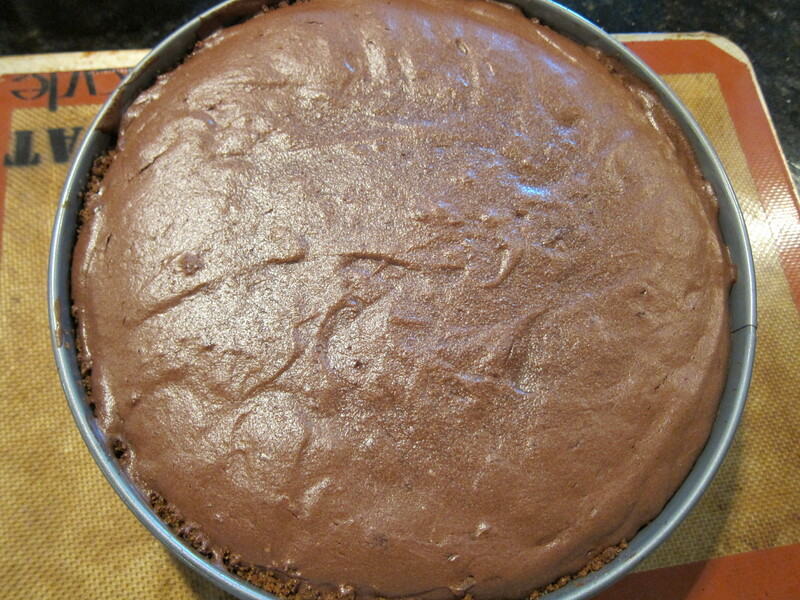 The cheesecake is baked in a 325 degree oven until set and slightly puffed on the edges and jiggly in the center, then it cooled until room temperature, then placed in the fridge to chill for at least 6 to 8 hours. 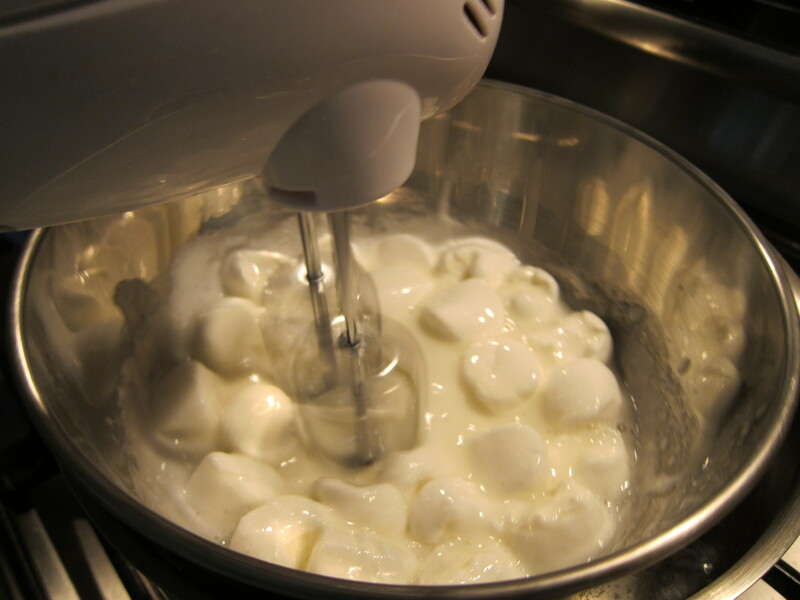 To make the marshmallow topping, egg whites are whisked together with sugar in a metal bowl set on top of simmering water until the sugar have completely dissolved. 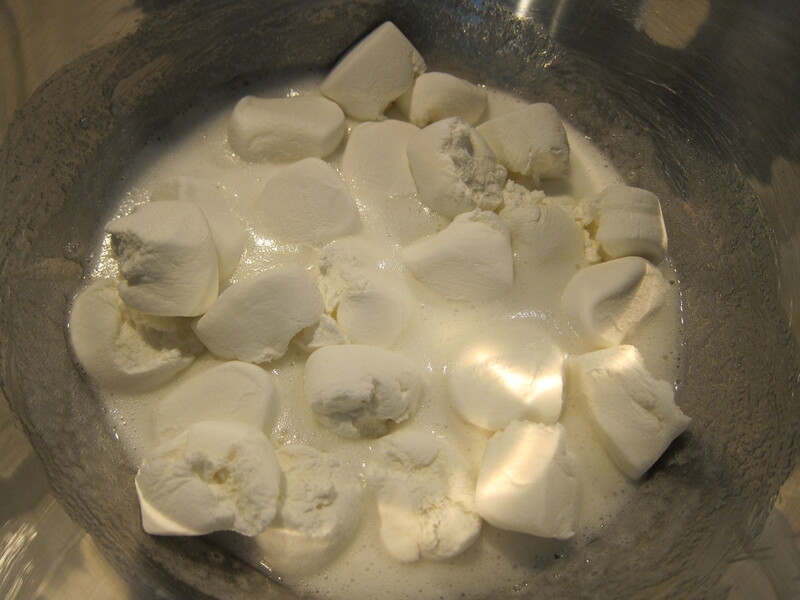 Large Marshmallow pieces are mixed into the hot egg white mixture, set aside for a few minutes. 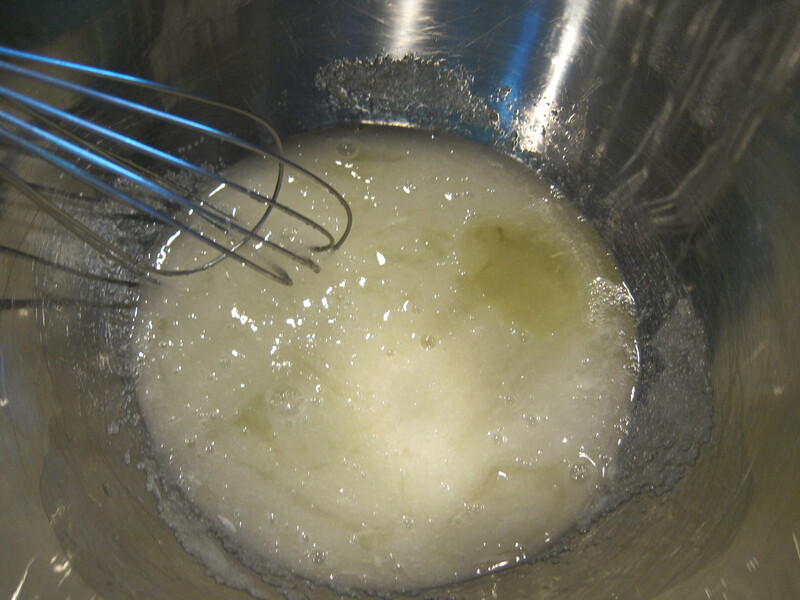 Then everything is beaten together along with some cream of tartar with a hand held mixer, until the mixture is thoroughly combined. The marshmallow cream is spread on top of the chilled cheese cake. 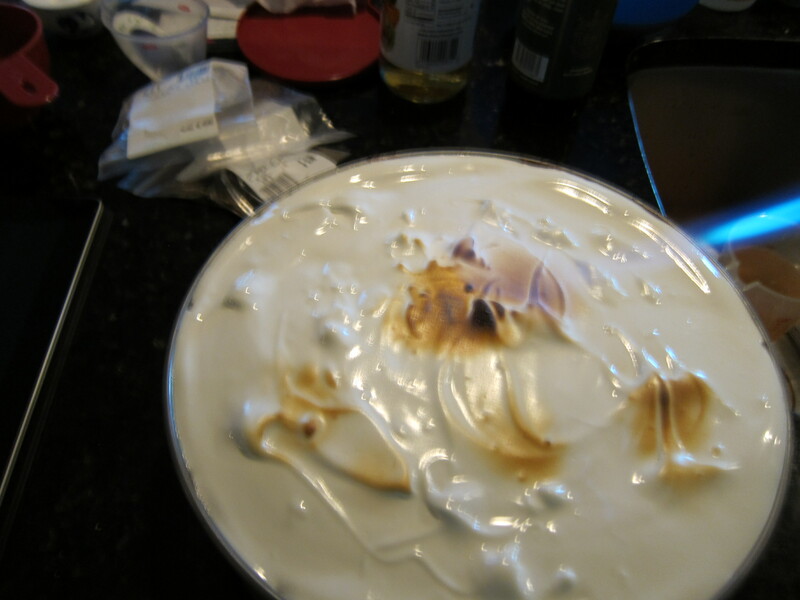 You can place the cheese cake in the oven on the top rack with the broiler on until the marshmallow begins to brown. Alternatively if you have a hand held mini torch, brown the marshmallow topping to your own liking. The cheesecake can be covered and chilled until ready to serve. 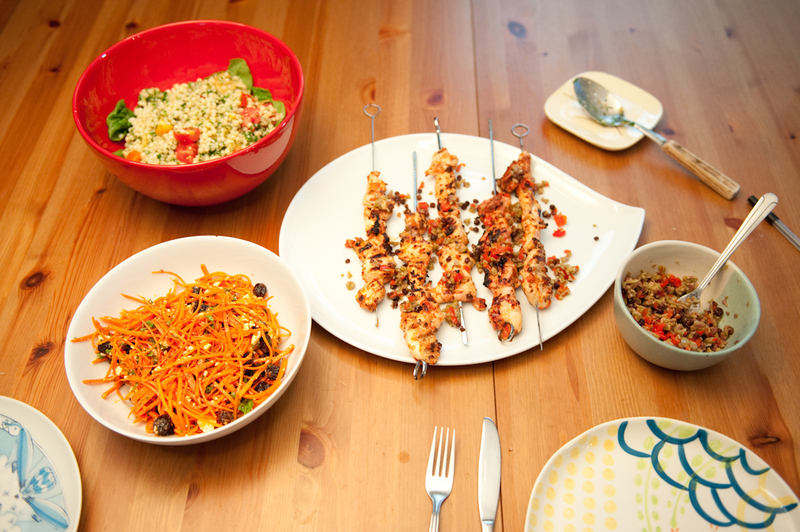 I doubled up the recipe and was able to serve 25 people, with still some extras to spare. 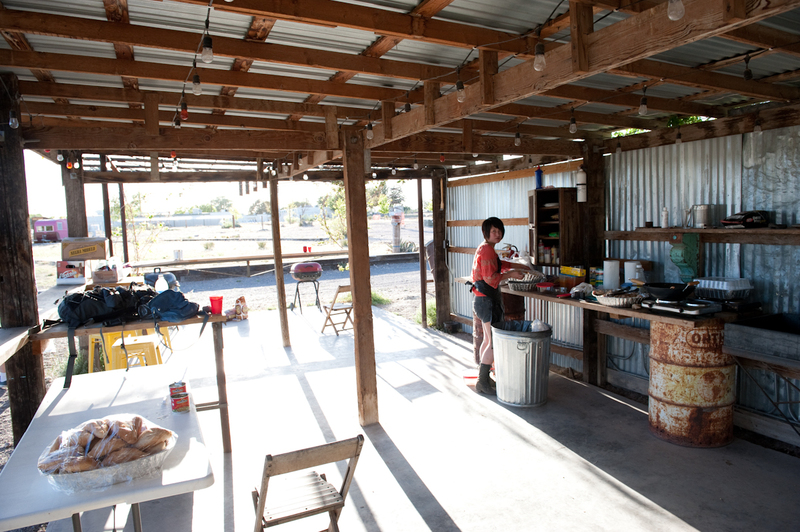 Cooking the pork early ensured that I had food to serve, and also I didn’t have to spend all day in Marfa cooking instead of relaxing and enjoying until 2 hours before the food is served. I brought Mexican Bolillo rolls to serve with the pulled pork, and I also made a ketchup vinegar and a mustard vinegar sauce to go with the pork. Overall it was a success, we had some pork left over that we made into pulled pork breakfast tostadas.